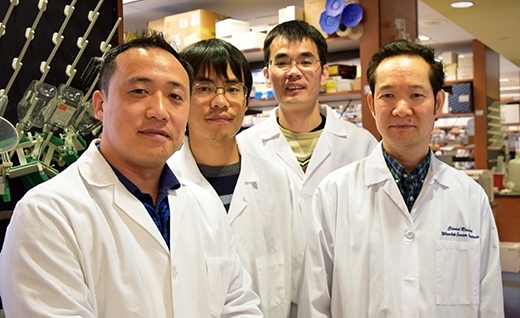 Principal Investigator Xingming Deng (far right) is pictured with his lab research team (left to right): Postdoctoral researchers Dongkyoo Park and Guo Chen with research associate Maohua Xie. Genetic mutations in lung cancers make cancerous cells in the body resistant to standard treatment therapies such as chemotherapy and radiation. Winship cancer biologist Xingming Deng, MD, PhD and his lab have identified two novel agents which could reverse the resistance of cancer cells to treatment. Deng is the principal investigator of two R01 grants from the National Institutes of Health aimed at investigating these agents. The grants, titled "Modulation of Bcl2 BH4 and mTOR in lung cancer therapeutics" and "Structure-based anticancer drug development," total over $3.6 million in total funds. Deng is discovering how Bcl2 BH4 and Bax proteins can trigger apoptosis or the programmed death of cancer cells. He has found that he can target cell death by inhibiting Bcl2 BH4 and/or activating Bax. For example, Deng says he can use a new small molecule BH4 antagonist (i.e. BDA-366) to inhibit Bcl2 BH4. Deng anticipates that a new class of anti-cancer agents will lead to the improvement of lung cancer outcomes and survival. If successful, Deng will have developed two novel targeted therapies for lung cancer as well as for other common malignancies such as multiple myeloma, leukemia and breast cancer. By 2020, these new lines of therapy are expected to be ready for clinical trials for patients at Emory. Deng is an associate professor in the Department of Radiation Oncology at Emory University School of Medicine. He is a core member of the Discovery and Developmental Therapeutics research program at Winship Cancer Institute of Emory University. His research accomplishments include the development of new agents and strategies for the treatment of cancer by targeting apoptosis and DNA repair mechanisms especially in tobacco-related, lung and head and neck cancers.